This car is perfect for a family and has so many nice features that make it sporty, fun to drive, and compatible for any family situation. I think that this is the single nicest car I have ever owned, and I am in love with how much fun this is to drive. The interior is wonderfully styled and is so roomy. This is probably the most comfortable seat I have ever had in a car. There is also plenty of room for the entire family (including the puppy) and all of its stuff, and we have already taken several big trips in this car. We took the whole family up to the mountains for the weekend, and all of us (including the dog) fit comfortably with room to spare. We decided to take it off road and test the drive train, and the car performed well. It was a lot of fun. The interior space is delightful, and it feels so my roomier than it actually is. The interior has high end finishes and is really well styled. I love how timeless but modern the design is on this car. I love how solid the fuel economy is on this car, and I also think that the drive is really smooth. At times the engine feels a little underpowered, but this is a minor issue compared to all of the pros on this car. CR-V responds smartly to inputs and handles well, yet it's comfortable ride and quiet cabin won't wake the kids. Under the hood, the turbocharged engine found in most trim levels provides best-in-class acceleration and fuel economy. 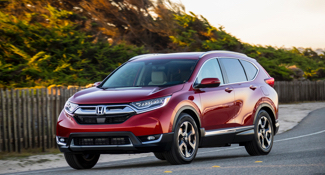 Wrapping everything up is the CR-V's excellent reputation for resale value and reliability. CR-V makes a ton of sense.